Well, it had to happen sometime. Plastic surgery has become such a common occurrence that it demanded a book be added to the library of manuals for kids explaining away certain facts of life. Luckily, one doctor saw fit to exploit this need for his own benefit. 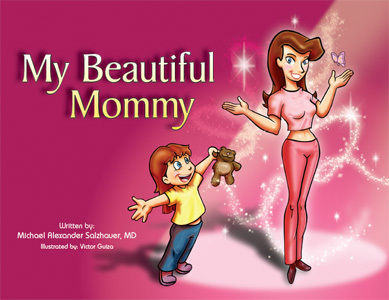 As Neatorama reports, Dr. Michael Salzhauer, a plastic surgeon out of Florida, has written and is now marketing a children’s book called My Beautiful Mommy. The book details the conversation and process a mother and daughter go through as the mother gets a tummy tuck and nose job. Apparently, the mother also gets a breast augmentation, but that goes without saying. Literally. The pictures change, but nothing is mentioned about the woman’s chest as that might have been too graphic for children. But cutting into someone’s abdomen to make them skinnier is not. The book is meant to give kids an explanation for why their parent is getting plastic surgery and to ease their fear of whether or not that parent will look different afterwards. Whether or not it will serve its purpose and whether or not there is a large enough audience of parents who cannot explain why they are getting plastic surgery to their own children out there remains to be seen. To read more about My Beautiful Mommy, click here.